Published: Sept. 10, 2015 at 02:26 p.m. Updated: Sept. 10, 2015 at 03:56 p.m. 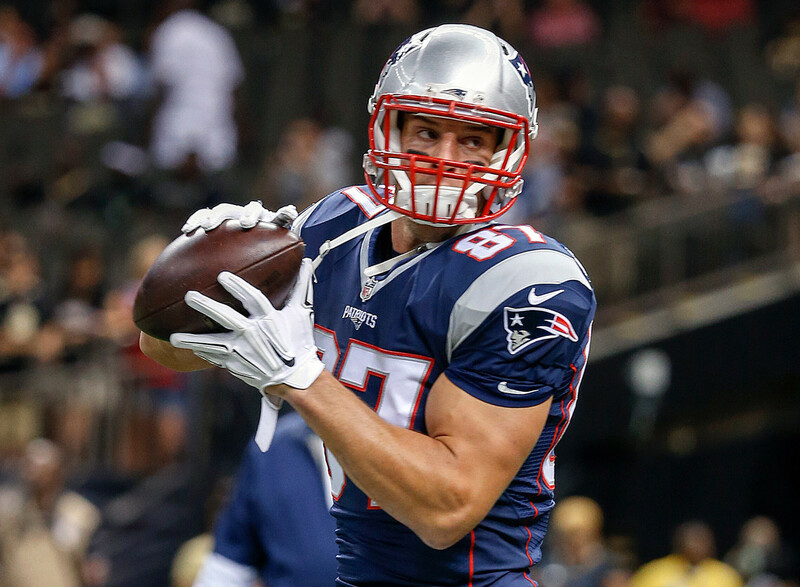 Since entering the league in 2010, only Dez Bryant (56) has more receiving touchdowns than Rob Gronkowski (54). Gronk led all tight ends in targets (131), receiving yards (1,124) and touchdowns (12) last season, so it's no wonder he's not only the top-ranked tight end for Week 1, but the top-ranked player over all. This list is based on the aggregate rankings of our five experts, and every one of us had Gronk at No. 1 for his position. Brown led the NFL in receptions (129) and receiving yards (1,698) last season, so it's no surprise he's the highest ranked WR for Week 1. He's also hyper consistent, with 32 straight games with five-plus receptions and 50-plus yards. With Martavis Bryant sidelined while serving a four-game suspension, the vast majority of the Pittsburgh passing targets should come Brown's way. He also has the benefit of playing against a Patriots secondary that lost Brandon Browner and Darrelle Revis in the offseason. As Rich Hribar noted on Twitter, Lacy has topped 100 total yards in nine consecutive games dating back to last season, the longest streak of all running backs. With Jordy Nelson on IR, Lacy could see more targets come his way in the passing game, in addition to a few more runs as well. He'll look to gash the Bears work-in-progress defense that is trying to transition to Vic Fangio's 3-4 scheme. Lacy could be in line for a HUGE day on Sunday, which is why we have him ranked as the top RB for Week 1. I sincerely hope no one is fretting over how the loss of Jordy Nelson will impact Aaron Rodgers in fantasy. Because it won't. He's still the best quarterback in the league and will prove it on the field once again. James Jones will be a nice fill-in as talented youngsters Jeff Janis and Ty Montgomery get more up to speed. Rodgers threw for 617 passing yards and tossed 10 touchdowns with zero interceptions against the Bears last season, making him a no-brainer as the top ranked QB for Week 1. The Vikings offense looked great in the preseason with Adrian Peterson on the sideline, and my feeling is that they'll feed him the ball early and often to a) get him back up to speed and b) let him remind the league he's the best back in the NFL. The loss of center John Sullivan to the IR boomerang hurts, but Peterson should still be contending for the highest scoring RB week when his Monday night opener comes to a close. He gets to run against a 49ers defense that lost seven key contributors this offseason -- I'd list them all, but I don't want to give 49er fans the sads. Were it not for his six touchdowns, we'd be talking about Jones' 2014 fantasy season with even more reverence, as he posted 104 receptions and 1,593 receiving yards. Those are totals he can easily achieve again in 2015 in Kyle Shanahan's offense, and he should get off to a great start in Week 1 against the Eagles secondary. Philadelphia allowed a league-worst 27.44 fantasy points per game to opposing wideouts last year, but have made strides to improve their secondary. That should help in the long run, but not against a talent like Jones. After struggling at the start of 2014, Brady closed out the year with 29 touchdowns and seven interceptions over the final 12 games of the season. A big reason why? The health of Rob Gronkowski. Despite the fact that Brady will be without Brandon LaFell and LeGarrette Blount, a healthy Gronk and Julian Edelman should be all he needs to carve up the Steelers' secondary. So far, the Graham-Russell Wilson connection has looked a bit shaky in the preseason, but that's not a reason to be too worried. Offensive coordinator Darrell Bevell traditionally goes quite vanilla in the exhibition season, and will likely have some tricks up his sleeve to get his top offseason acquisition plenty of targets. The Rams boast a talented defense that could limit the scoring in this contest, but at a volatile position like tight end there's no way you sit a stud like Graham. Despite his team boasting the NFL's top rushing attack, Dez Bryant still managed to lead the NFL in receiving touchdowns (16) a season ago. With the backfield in flux now as more of a committee, Dez's role as a scoring threat has become even more paramount to this offense. He gets to feast on a banged up Giants secondary in Week 1, and needs to be in all lineups. Olsen became the first Panthers tight end to post a 1,000-plus receiving yards in a season in 2014, and the team will need him to improve upon that total this year with Kelvin Benjamin sidelined with an ACL tear. Olsen has a solid Week 1 matchup against the Jaguars, too, and is one of the tight ends you can trust as the season kicks off. From Weeks 9 to 17 last year, Hill led the NFL in rushing yards (929) and yards per carry (5.4) while sparking the Bengals' offense. In the preseason, he was very clearly the RB1 in this offense, and should be able to pick up right where he left off running against the Raiders defense. Kelce posted a stat line of 67/862/5 even though he only played the 23rd most snaps among NFL tight ends. He should have a bigger role this season, which is why we collectively have him ranked so highly. Yes, Luck is facing the tough Buffalo Bills defense, but he's also Andrew Luck. The Bills boast a terrifying front seven, but their defensive backfield can leave a little to be desired. With so many talented targets in his passing attack, Luck should still post very solid QB totals in Week 1. Were Martavis Bryant not suspended, I'm guessing we would have collectively ranked Big Ben even higher. He had roughly 70 more passing yards per game and through almost twice as many touchdowns per game with Bryant in the lineup last year. However, he is still a top-level QB going against a relatively inexperienced secondary. Roethlisberger should be able to make some noise for fantasy owners on Thursday night. Even though it sometimes seems like his offense doesn't want him to be great, Jamaal Charles consistently is. He's averaged over five yards per carry in every one of his seven seasons, and scored 14 total touchdowns last season. The Chiefs offense could be even better this year with Jeremy Maclin in town to stretch the field (and hopefully catch a touchdown as a wide receiver). Charles doesn't have the greatest Week 1 matchup against the stout Houston Texans defense, but he should still produce nonetheless. Ryan gets to open the season at home against the Eagles leaky secondary. He has a healthy Julio Jones, emerging Leonard Hankerson, and old reliable Roddy White. What's not to like? Everyone knows how amazing OBJ was last season, but he was particularly good against the Cowboys, scoring four touchdowns (including that famous one) in his two games against them. The Dallas secondary suffered some losses due to injury this offseason, and with this game potentially turning into a high-scoring affair, Beckham will receive a sizeable amount of targets to post a solid Week 1 total. Last year, Thomas became the third player in NFL history to record at least 1,400 yards and 10 touchdowns in three straight seasons. He's one of the safest wide receiver plays on a weekly basis after ripping off 10 100-plus yard games over the final 13 games of 2014. While Manning faded down the stretch last season, he remains the pilot of one of the NFL's top offenses and will be looking to start 2015 off on the right foot. The Ravens boasted the best fantasy defense against running backs a season ago, which could mean that the Broncos rely more on the arm of Manning to try and secure a Week 1 win. Fantasy owners will be keeping their fingers crossed that comes true. Beast Mode is back, but has a tough Week 1 matchup against a Rams defense that seventh-fewest fantasy points to running backs a year ago and has added more talent to the defensive line with the acquisition of Nick Fairley. Lynch is still a safe RB1 for Week 1, but we'll need to see how the Seattle offense shakes out in the red zone with the massive Jimmy Graham likely to eat up targets. Cameron didn't flash too much in the preseason, but he gets a juicy Week 1 matchup against the Redskins in the Dolphins exciting passing attack. He's one of the better starts this week among tight ends. Megatron is fully healthy again, and we know Matthew Stafford loves chucking the rock to him. Even though the Chargers have a solid secondary, Johnson should still be able to get his in Week 1. With the Bears wide receiving corps so dinged up (Alshon Jeffery - calf, Eddie Royal - hip, Marquess Wilson - hamstring) the offense could funnel through Forte even more at the start of the game. Forte has had a lot of success against the Packers recently, too, topping 100 rushing yards in three of his last four games against his division rival. The only concern is that if this game gets too out of hand, the Bears might pull Forte to not risk injury, but that's no reason to sit a stud like Forte. Bennett posted career highs across the board last season (90 receptions, 916 receiving yards, six touchdowns), and could receive a healthy amount of targets in this contest given the rash of injuries to the Bears WRs. It'll be interesting to see which odd trend holds true for Bennett in this one: He's scored zero touchdowns in eight career meetings against the Packers, but has also been historically productive in September, with 10 of his 20 career touchdowns coming in that month. Suffering an AC joint sprain in Week 3 of the preseason certainly hurt Cobb's stock a bit, but he has said he'll be playing through the injury regardless in Week 1. Which is a great thing for fantasy owners, as Cobb has scored five touchdowns in his last three games against the Bears, and should be able to make plenty of noise out of the slot with Davante Adams and Jones/Janis/Montgomery keeping the cornerbacks busy on the outside.